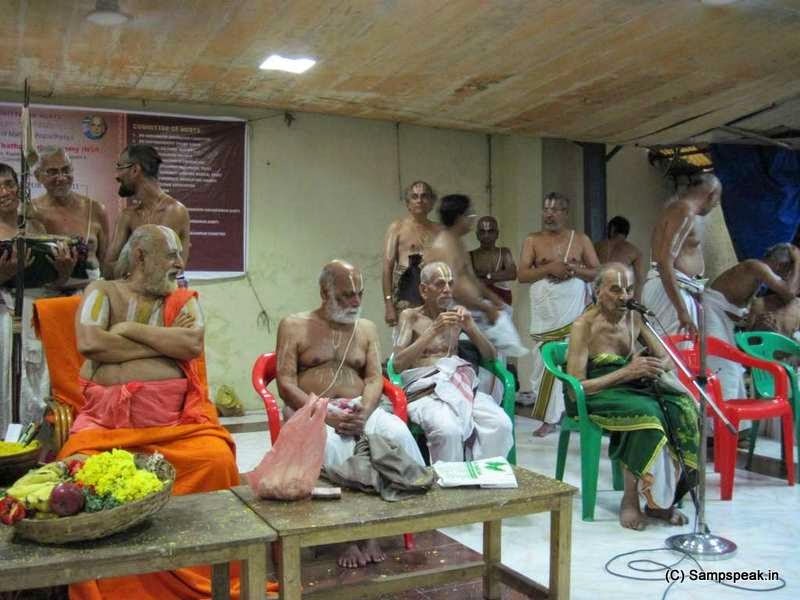 A photo taken during the recent Thiruther of Sri Varadhar at Thiruvallikkeni, and the seemingly ordinarily old man on the frame is no ordinary person !! Thiruvallikkeni aka Triplicane is a famed land… yearsTriplicane was the seat of freedom struggle, It is a place where religion, nationalistic fervour, patriotism, sports, education and the individual dignity have interspersed for the benefit of the State and the larger interests of the Nation. The place acquired its name from the famed temple pond ‘Kairavini’ – the pond of lilies – thus becoming ‘Thiru Allik Keni’ – the pond consisting of lily flowers. Our lives dwell around the Great Sri Parthasarathi Swami Thirukovil which has existed for thousands of years. There are also many famous people, many of whom live a simple life – with even neighbours not (caring to) knowing much. At the famous divyadesam housing the Temple of Sri Parthasarathi, there are festivals throughout the year … in every purappadu, one can see large group of Thennacharya Srivaishnavaites rendering divyaprabandham, Vedas and doing service to Lord in many forms. 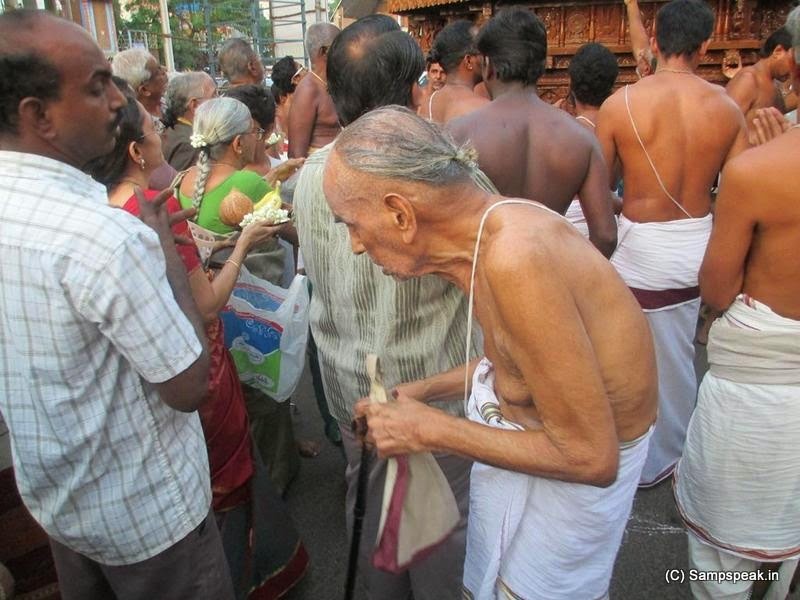 Those who frequent Triplicane, for sure, could have seen this frail old man, who is 93+ - he walks measured steps, greets people and is so simple …… not many of us know of his virtues, his wisdom and his achievements. 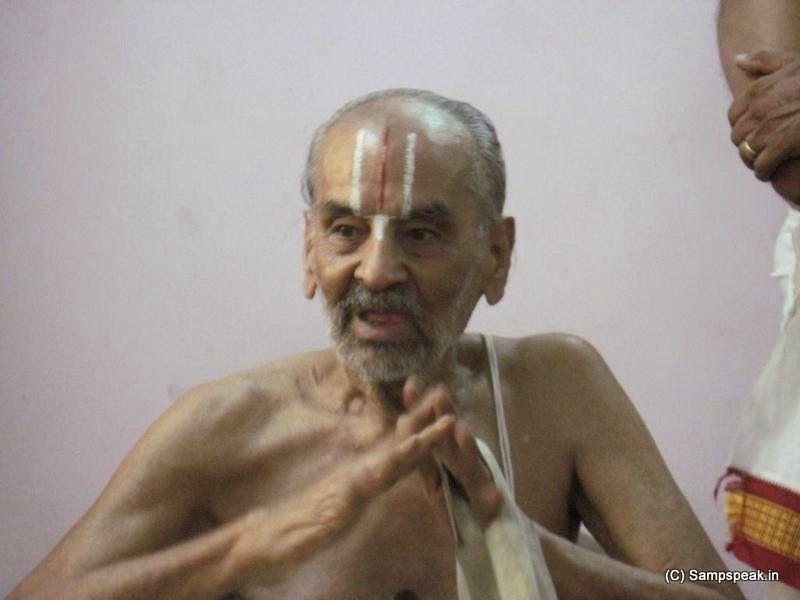 Venkatapuram Vurupattur Srinivasachariar Ramanuajan, better known as Dr VVR is 93+ now. His steps are measured, comes to the temple regularly, cooks his own food, does all by himself, talks little but has written so much. He worked initially in Loyola college and then had a long and distinguished innings in the Chemistry Department of Madras University. This scholar is equally at ease in Tamil, English, Sanskrit and Telegu. He has written many books. His name, is probably a household name to the Research scholars of Chemistry - his work “Inorganic Semi Micro Qualitative Analysis”, a lab manual first published in 1965, is an unparalleled work in this field. The no. of reprints bear testimony to its usefulness to the research scholars churned out by the Universities. 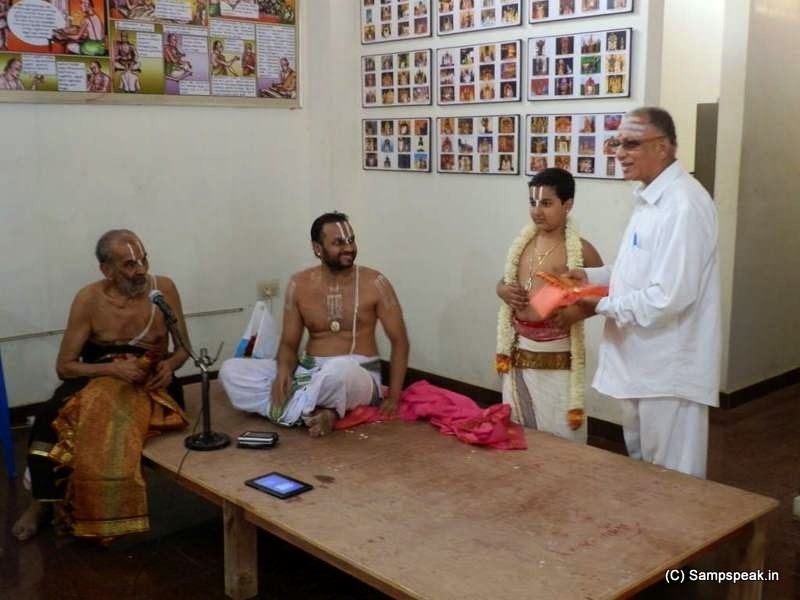 Besides his scholastic embellishments, he has contributed lot to the Sri Vaishnava Sampradhayam. He has been publishing the book “Yathiraja Pathuka” for over 3 decades now. “Yatheendra Pravana Prabhavam” a Purvacharya grantham was brought to print after a century of years, thanks to his unflinching efforts. He has been delivering discourses / Upanyasams on Granthas holding aloft the Thennacharya sampradhayam. His literary works include : Commentary on Sri Vishnu Sahasramanam,Bhagavat Geetha Saram, commentary on Gadhyatrayam, Krishna Charithram and many more. His enthusiasm and the urge to impart his experience and learning to the next generation belies his age and one still wonders that we saw of him is only a tiny bit of his wonderful self. SYMA takes special pride in the fact that this suave Professor was associated with us as noteworthy Judge in some of the competitions we conducted for the youth, in our nascent years. BLISS prays for his long and healthy life. ~ and Yours Truly takes pride and pleasure in knowing him …..
With very great regards to this kind gentleman whom rever most .. here are some photos taken by me on various occasions ..
Dr VVR felicitating Sri Sadajit - Sri Elayavalli Sriraman Swami also seen. Awesome, this is so good to read and know. It felt great to know of his achievements starting way back in 1958. Thanks for the post. முனைவர் பட்டம் பெற்ற ,சர்வதேச புகழ் பெற்ற அறிவியலாளரான இந்த ஸ்ரீவைஷ்ணவ மஹானுபாவர் தள்ளாத வயதில் கோலூன்றி கண்ணாடி அணியாமல் அத்யாபக கோஷ்டியுடன் நின்று பெருமாளுக்கு சேவை செய்வதற்கு காத்து நிற்பதைப் பார்க்கும் போது திருமங்கையாழ்வார் 'தாயே ,தந்தையென்றும்'என திருவேங்கடவனுக்கருளிய பாசுரத்திற்கான வாழும் உதாரணமாகத் திகழ்கிறார் என எண்ணத்தோன்றும் .இம்மஹானுபவரின் திருவடித்தாமரைகளில் அடியேன் பஞ்சாங்க தெண்டன் சமர்ப்பிக்கிறேன் . Sri Vaishnavit lost one more scholar. Swami is a wonderful, a great scholar in our சம்ப்ரதாயம் but very humble. From my school days, whenever I pass his house, seen mami sitting outside. (I think she wasn't keep well those days). Swami took care of home, attend to all utsavam in Parthasarathy perumal koil and managed single handedly running Yathiraja Padhuka. I used to feel quite proud that my appa (Sri. 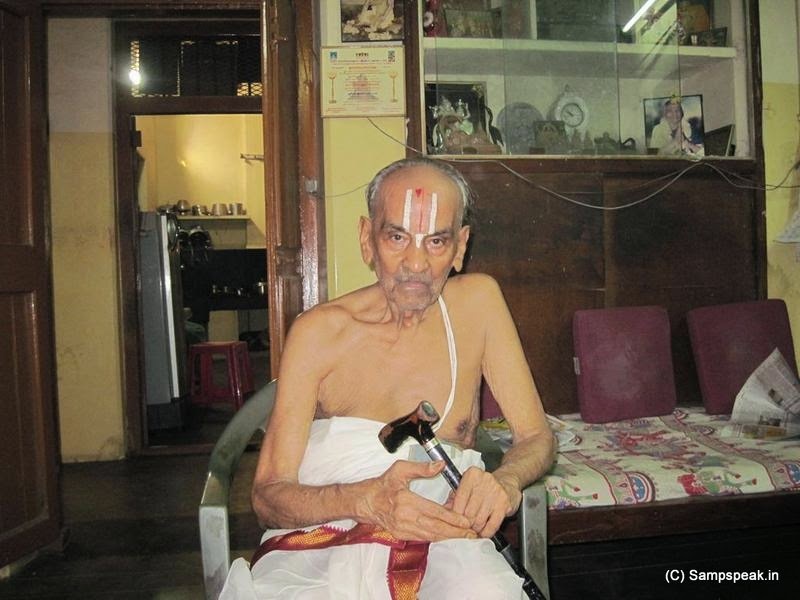 Vijayaraghavan Swami, known for his chittarakadhai in Geethacharyan and some of Swamy's as well) was closely associated with swamy and the few times I went to his home, he treated me like someone of his own. Just returned home after paying last respects, mind whirling trying to recall small conversations, anecdotes. இன்னும் ஒரு நூற்றாண்டு இரும்! RIP. This great person will ever be remembered for his strong devotion to Lord Parthasarathy. Though he had opportunity to lead a life abroad, he chose a life of Kainkaryam to his beloved partha and writings on vaishnav samprathayam. Feeling proud to share that we are closely related to him through his wife Smt Vedavalli who was very a affectionate aththai to us. Rama on behalf of P B Doraiswami & Family. Namo Namaha! Thanks a million, Swami. The awesome Mahathma has adorned Thirunadu now. The Mahatma's kindness, simplicity, knowledge and way of life are etched in my heart and memory. His Books are Treasures. Pallandu to the Lotus Feet of the Mahatma! Dr.VVR Swamy, encouraged people like me even to write and got them published in "YP". ரத்நாபஹாரி பார்த்திப: என்று உயர்ந்த வஸ்துவை தனக்காக்கிக் கொள்பவன் பரமாத்மா. அவருக்கான பேறு நம் வயிறு மருக உறுப்பில்லை என விடை அளிப்போம். வாழ் நெறியை கடைபிடிப்போம். He shared a nice relationship with both young and old. My son, great grand son of his sister, Jayammal,used to learn music from his daughter during the weekends since he was 5+ yrs old. Every time he went there both my son and mama thatha used to spend time together and became thick friends. Years rolled by and their friendship was in tact even though they saw each other infrequently. Any time we came to triplicane, my son would want to visit him and anytime we met thatha would first enquire about his little friend.